If you're a fan of Carrie Underwood then we’ve got some exciting news for you. The country superstar is on tour in 2019 with her latest album, “Cry Pretty.” Joining her on the road are the phenomenal Maddie and Tae, and the brilliant Runaway June! It’s all happening on Tuesday 21st May 2019 at the Moda Center! 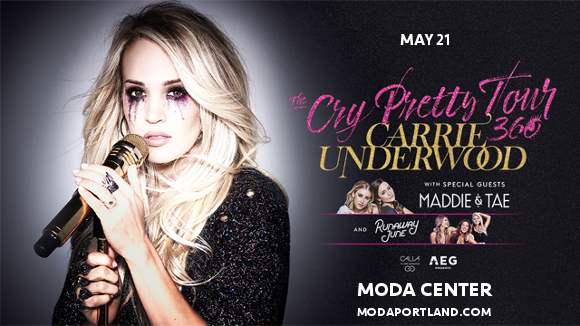 Don’t miss out – get your tickets to Carrie Underwood, Maddie and Tae & Runaway June event today and catch it all LIVE! Her latest album, shooting straight to number one on the Billboard 200, has made Carrie Underwood the first female country artist to top the Billboard 200 with four albums back-to-back! has been met with virtually universal acclaim from critics. The Diamondback described the album as; ”poised and mature, her sixth studio album effortlessly differentiates itself through the masterful lyricism and savvy falsettos that trademark Underwood's undeniable talent, even over a decade after her American Idol win. The organic sense of vulnerability conveyed throughout the entire album leaves the listener with the impression of having just sat down and talked for hours with Underwood herself." No Carrie Underwood fan can afford not to be part of this incredible tour. What are you waiting for?? Grab those tickets NOW while they last!